Millions of people worldwide suffer with infertility and recurrent miscarriage and in thousands of unexplained cases, hypothyroidism may be the underlying cause. A new infographic created by White Lotus Naturopathic Clinic in Toronto outlines the importance of the thyroid gland in female fertility, in healthy pregnancy, and in the prevention of miscarriage. Thyroid conditions, including Hypothyroidism, Hashimoto's disease, and Grave’s disease are one of the most common causes of unexplained infertility and recurrent miscarriage. The American Association of Clinical Endocrinologists has warned that 1 in 10 Americans suffer from thyroid disease. Despite this staggering statistic, half of patients remain undiagnosed. Many of these people will be in their childbearing years. 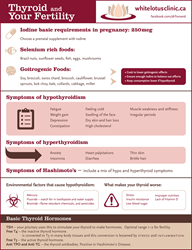 Hypothyroidism is a common disorder that has major impacts on fertility and pregnancy, according to a new Infographic released by Toronto Naturopath, White Lotus Integrative Medicine. Hypothyroidism disrupts a woman's hormones. Thyroid disease can block ovulation or implantation and cause miscarriage. As babies don't make any thyroid hormone of their own for the entire first trimester of pregnancy, they are completely dependent on the mother to provide the thyroid hormone required for their growth. Poor thyroid function in pregnancy can also reduce the IQ of the baby, as suggested by multiple studies on this topic. As such, it is crucial for women to achieve optimal thyroid function to both become pregnant, and also to carry a healthy pregnancy to term. Importantly, the infographic includes the recommended ranges for thyroid lab tests which are in fact tighter for pregnancy than for in general health. The demand for thyroid hormone is greater in pregnancy, due to metabolic needs. A pregnant woman also loses more iodine through her urine, increasing her needs for the key mineral involved in thyroid function. Carrier proteins also bind up the thyroid hormone more in pregnancy, making it less available to the baby. The thyroid needs to function well to promote the health of the developing embryo under such conditions. It is important that women in their reproductive years know the signs and symptoms of hypothyroidism in order to protect the health of their babies. The infographic also lists the main symptoms and signs that can signify a hidden thyroid disorder and details the toxic environmental factors that impact thyroid function. A section also outlines the important dietary sources rich in the key nutrients that should be included in the diet for optimal thyroid health. White Lotus Naturopathic Clinic and Integrated Health is a leader in the field of naturopathic women’s health and fertility health care in Toronto, Ontario Canada. In addition to clinical practice, the Naturopathic Doctors at White Lotus publish evidence-based articles and provide educational seminars to advance both public and practitioner knowledge on complementary alternative medicine topics.